First Round : Jack Nicklaus and Gary Player were tied at five-under 67. Tom Kite, Rex Caldwell and Jim Simons were at 68. Second Round : Simons was alone in lead at seven-under l37. Player, Andy Bean, Ed Sneed and Bobby Wadkins were at l39. Third Round : Simons birdied last hole for six-under 210, with Bill Kratzert at 211 and Rod Curl 212. Cut Notes: 73 players at 149. Missed Cut: Homero Blancas (79-81-MC), Ron Cerrudo (77-77-MC), Bob Cole (79-73-MC), Dan Edwards (73-77-MC), Ray Floyd (74-80-MC), Rod Funseth (74-79-MC), David Good (81-80-MC), Phil Hancock (76-77-MC), Mike Hill (78-76-MC), Don January (72,78-MC), Stan Lee (76-74-MC), John Lister (76-78-MC), Lyn Lott (75-78-MC), Mark Lye (79-75-MC), John Mahaffey (75-76-MC), Bob Mallon (77-77-MC), Fred Marti (73-77-MC), Rik Massengale (80-73-MC), Jerry McGee (77-76-MC), Florentino Molina (74-76-MC), Orville Moody (75-76-MC), Takashi Murakami (78-77-MC), Jim Nelford (74-76-MC), Bob Nichols (75-76-MC), Peter Oosterhuis (78-77-MC), Joe Porter (76-77-MC), Jack Renner (76-77-MC), Chi Chi Rodriguez (76-76-MC), Bill Rogers (76-75-MC), John Schlee (74-79-MC), J. C. Snead (74-76-MC), Steve Veriato (77-73-MC). Weather: Thursday and Friday, mostly sunny. Saturday and Sunday, overcast. Lift, clean and place in fairway first two days. Post-game pundits tabbed it the "up and down" Memorial and with good reason. 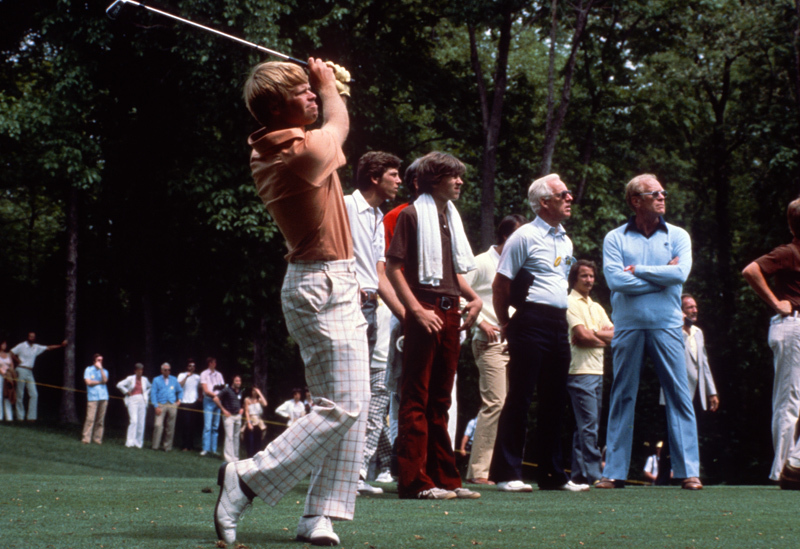 After the storm-delayed finish in 1977, Memorial officials hoped the law of averages would deliver good weather in 1978. They were disappointed - but only at the beginning, fortunately. Rain pelted the Columbus area with unusual intensity the week before the tournament, turning the Muirfield Village course uncommonly soft. Then, on Tuesday, a veritable monsoon struck, canceling the Pro-Am in which President Ford, Bob Hope, Glen Campbell and 150 amateurs were to have played. The course finally reopened on Wednesday noon at about the time the sun came out (it stayed the remainder of the week), but the pros played practice rounds on a squashy, soggy turf. Considering the conditions and the fact the greens crew had been unable to operate on schedule, PGA officials elected to allow the ball played "up" for Thursday's opening round. Host Nicklaus didn't like it, but it was an emergency measure of necessity. Players picked up the golf ball, cleaned it and reset it by hand as they saw fit. The procedure was continued through Friday's second round, but by Saturday the PGA felt Muirfield had sufficiently dried to return the standard "down" format - or "playing 'em as they lie." Not surprisingly, scores went down during the "up" rounds and up during the "down" days. "Getting your hands on the golf ball before each shot makes a difference," explained Ed Sneed. Softer-than-usual greens also invited "target" golf. Twenty-seven broke par in the first round, eight of them under 70; the second round figures were 19-8: the third 9-2 and fourth 6-1. Of playing the ball "up," Nicklaus decided, "it was the right decision but it certainly was not golf." Champion Jim Simons provided an appropriate correlation for the 1978 Memorial theme. He may have set a record for getting it "up and down." In the final round alone he had seven saves for par, five of them in the last seven holes. A winner only once before in his six TOUR years, Simons survived his highest round of the week, a 74, for 285, good enough to distance Bill Kratzert by one stroke. He holed a 21-foot putt on No. 18, where Kratzert had missed what would have been a tying 10 footer. The latter also had a 74 final round. Fuzzy Zoeller was the only other pro under Muirfield's 288 par (70- 287), while Nicklaus, Gary Player and Sneed were even. Nicklaus "hit every drive in the middle of the fairway" and Player carded six birdies to co-lead the first round with 67's. They tied the tournament record, but Nicklaus suggested "with asterisks," because of playing the ball "up". Simons gave a tip-off: he hit the rough on the first three holes, but still managed two pars and a birdie. He finished with 68, a figure shared by Tom Kite and Rex Caldwell. In the second round, Nicklaus struggled to a front nine of 41 and admitted it hurt to see his name come off the leader board-in his own tournament. Player came to No. 18 two under for the day and seven for the tournament, but wasted strokes in front of the green and three-putted for a double-bogey and 72-139. Simons dipped six under after nine holes, but bogeyed Nos. 16 and 17 and saved par on No. 18 with a 40-foot putt, finishing with a 69-137 for the lead. Sneed (70), Andy Bean (68), and Bobby Wadkins (69), were also at 139, Nicklaus four back at 76-143. Playing it "down" on Saturday didn't change Simon's pattern. He produced five "up and down" saves in the first 17 holes and dropped an 8-foot birdie putt on No. 18 for a 73-210 and a stroke margin over Kratzert (69-211). Rod Curl followed Friday's 67 with a 68-the best 36-hole stretch in the tournament - for 212. Curl exited the scramble early in the final round, eventually staggering to an 81; Kratzert lost ground with a double bogey on No. 2, and Nicklaus put himself at a disadvantage with a nightmarish six on the par-3 No. 4. Simons parred the latter hole and you can guess how; up and down from a bunker. Nicklaus steadied himself with four birdies, pulling to within one of the lead after No. 15, but a double bogey on No. 17 ended his bid. Kratzert kept pressing and, despite the missed putt on No. 18, still had a chance - if Simons were to stumble. But Simons simply refused. Time after time, he faced bogey and salvaged par. Maybe he just didn't see all the trouble he was getting into. He revealed afterward that he is woefully nearsighted, legally blind without his contact lenses and used a 50-cent piece to mark his ball on the green. "I was fighting it, and fatigued coming in," admitted Simons, $50,000 - or 100,000 ball-markers - richer. "But I made some clutch putts." Simons had earned the tag "grinder" among his fellow pros - he just kept grinding away, working and struggling to improve. "I think I'm a talented player," he suggested, "but my talents lie in areas different from other players. I'm not long off the tee. But my ability to think is important. I can maneuver the ball. I can hang in there." One of his thought-actions caused considerable comment. After the PGA slapped David Graham with a $200 fine for slow play, Simons, who had a reputation for slow play, began a new routine: When he hit first, he immediately headed for the ropes, joined the walking gallery and reentered the roped area when he reached his ball. "It's probably not the best etiquette," he conceded, "but I get a head start on my next shot. Then I can go through my routine of testing the wind and so forth." Simons avoided a penalty, but Arnold Palmer incurred one on Saturday when he lost track of the rule change and improved his lie on No. 6. The Muirfield course accommodated the pros - and galleries - beautifully, as usual. But the parking lots were something else. They were quagmires, unusable. Every available paved lot in the area was "borrowed" and spectators were brought to Muirfield by an amazing shuttle bus system. One of the emergency lots happened to be at the Columbus Zoo, two miles away. One day, an obviously misdirected elderly couple disembarked at the Muirfield gate and complained. "But we came to see the zoo!"